lulu is quite delicious, like a Christmas chocolate, but she might be one with a hint of smoky salt or a dot of chili pepper. I don't think I'd cross Lulu, I see a potential mean streak, ready to be ignited. Love to see your work space and be reminded of the sun which is apparently hiding somewhere in your neighbourhood. I like a feisty Lulu! 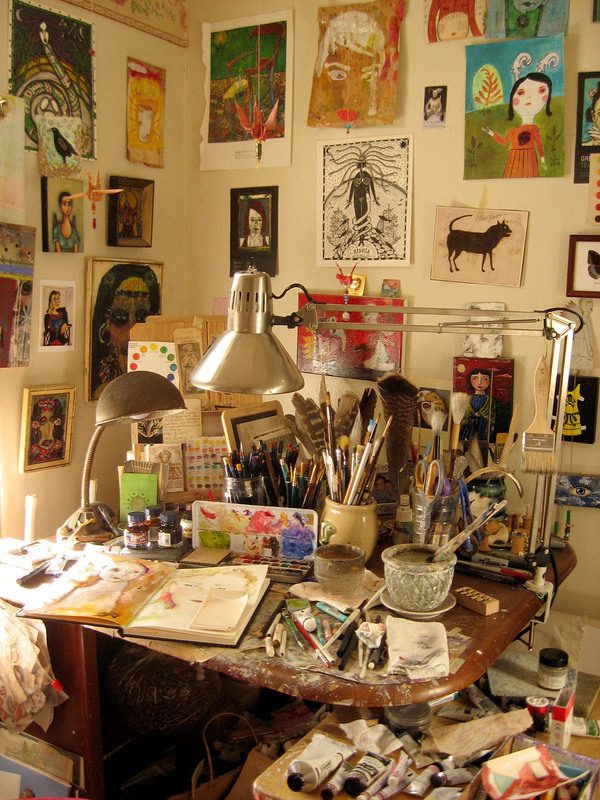 But my attention was drawn by your worktable so like mine (the stuff on it, and the size, I mean) and the lamp on the left, which is exactly like mine. What a nosey little bugger i am...i loved sneaking around your room while you were out. it's a great thing, being un-neat. lulu is again shifting with the tides and the moon. your working is getting stronger. each one has so much voice and passion. I think it's coming from within your soul/sole. i feel 2012 is going to be a magical year for you my dear. i'm so excited by this new work. small piece speak softly and have perhaps more to say...larger pieces may have more volume and more can hear but their passions will all be your's. xxxooo to a happy you. ps...go to my tumblr sometime. 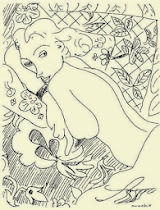 i posted some images there by a robert ohnigian. he calls his work, "painting with paper." 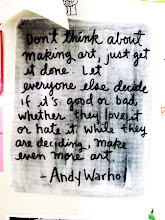 I thought of you immediately...paper is part of your paint box. Gawd, *sigh* I love visiting your blog. 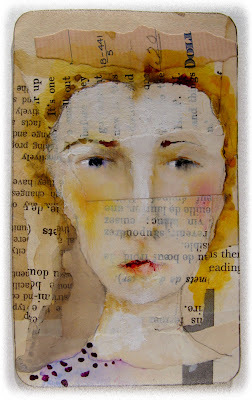 I love how your work is so subtle and honest, gentle. i like this face a lot. lulu? seems like she's got lots of gumption. i like her! I am soooooo enjoying Lunette. She sits in a little frame that suits her on my bookshelf I use as my nightstand. I look at her every day. 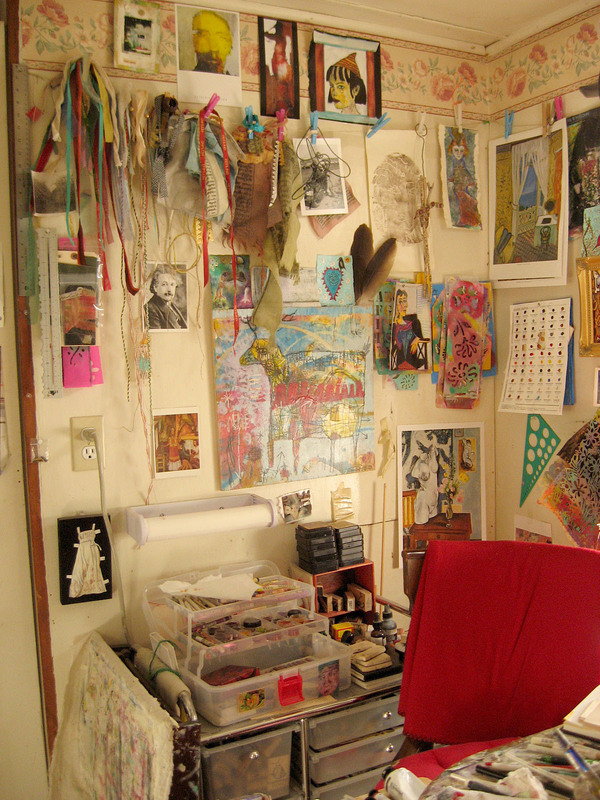 I love your work space Lynne! So much to look at and sooooo warm and cozy. No wonder your pieces are so wonderful...you have a lot of inspiration all around you. I love it when the sun streams in through the window onto my work table. It makes me want to paint and play! Your table looks just like mine when I'm in the middle of painting or drawing. I'm quite a neat person on the whole but when I'm painting I have to go with the flow and sometimes things pile up so much I have to purposefully put things back on shelves to make room for the thing I'm working on! Thanks for sharig this, lovely work! Lulu seems a bit pouty and stubborn to me- like some of my students! She might just cross her arms, turn her back, and refuse to do anything. I like her; she's lovely. I also like seeing your studio- it's fascinating to me to see where other artists work. p.s. darn, darn, darn- I wanted to buy the bird/person. Too late! big big hugs to you, and wishes for the best new year ever! Love the w.i.p. on the table ... especially the one on the left. Excellent Lulu, welcome to the world! 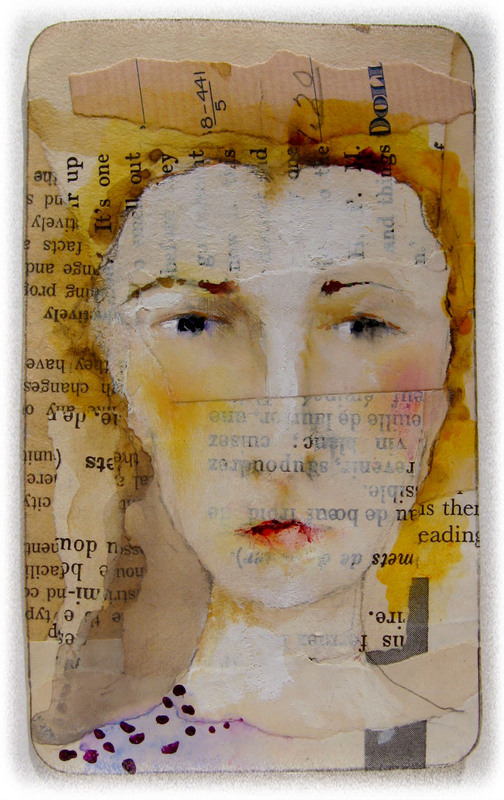 Thank you for the peek into your artmaking corner and the stillman and birn info. It looks small/but then everything is at hand , 'at your elbow' i loved looking at some of your collection of post cards and other images. 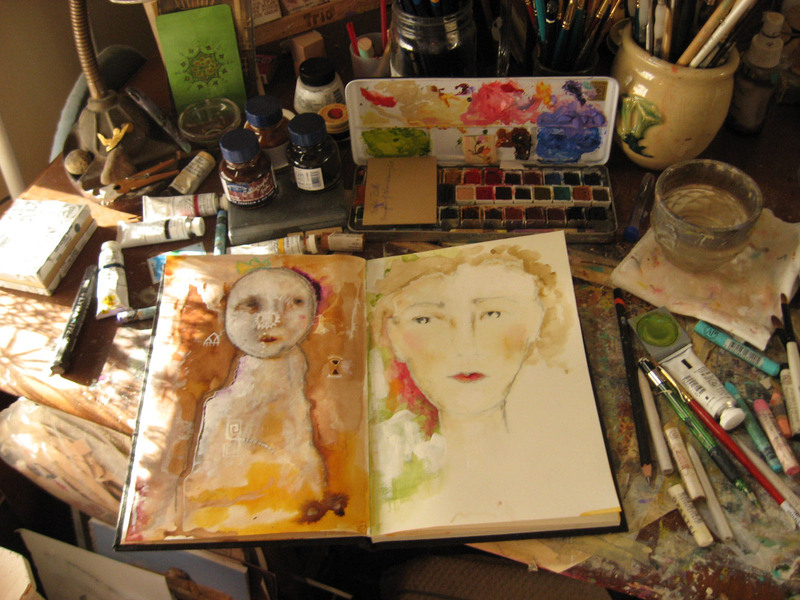 I love these glimpses into your studio Lynne, Such wonderful art and colour everywhere, but such a feeling of peace when I glimpse in. Seeing your work in a studio setting is such a treat. I'm feeling the creativity. It simmers! LOVE your cards so much! 2012?! .... Can you believe it? All the best to you Lynne and may your creativity boil and bubble all year long. When I've been away for a while it's always fun to look at a group of your faces all at once and see which one pops out at me the most. Lulu is the one this time. maybe I'm in a feisty mood. I bet you could use these as soul collage cards. Pull a face card and see what she/he has to teach us at this time. Thanks for the glimpse into the place where you create. 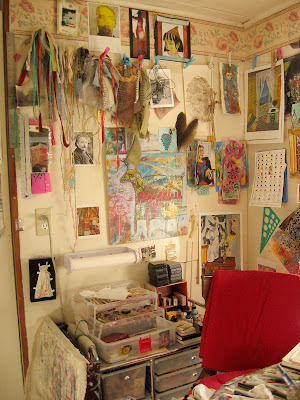 So much inspiration in every nook and cranny!